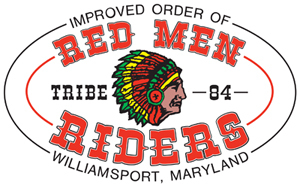 The Red Men Riders Club was established in 2004 for Red Men and Pocahontas members who enjoy motorcycling. The stated purpose of the Club is to actively support motorcycling for the membership. The Club is involved in organizing rides and events centering on motorcycling activities. The Club is also involved in fundraising for donations to various qualified charitable organizations. The Riders Club is open to all Red Men and Order of Pocahontas members in good standing. Dues are $10 per year. The Riders Club meets at 7 PM on the first Wednesday of each month at Tribe 84.